The narrowest possible margin decided our Best Actor race this year, in a contest between a grizzled (yet rarely honored!) veteran of the acting world and a fresh-to-most-of-the-world newcomer. Some old favourites make a return as well, and a number of roles that draw things to a conclusion. 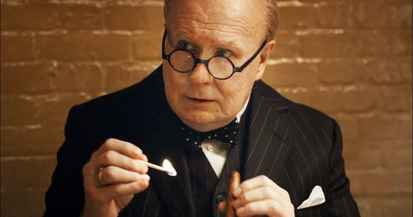 Gary Oldman's uncanny rendering of Winston Churchill in Darkest Hour captures our top spot, a tour de force that he uses to lift up the movie on his back and carry it through. Known for his disappearing acts, he dives into the great British prime minister with all he can muster. Capturing his electrifying manner, his leadership, his charisma, Oldman also shows him with his own doubts amidst his crucial tenure in the worst times of World War II. And not for nothing, but it enlivens an otherwise quite ordinary film, and makes him the unofficial MVP of 2017 film. A very very close second goes to Daniel Kaluuya in Get Out, as the protagonist Chris. Having to navigate the world of upper class white suburbia, only to find out there's something even more sinister than he could have imagined going on, Kaluuya does an amazing amount of acting with his eyes, holding fast against slights and suspicions until his very humanity is threatened. Getting the audience to empathize with him completely, you feel every bit of Chris' agony and desperation. In what may be his final performance, Daniel Day-Lewis places third for Phantom Thread. It's not one of the bombastic performances he's often heralded for, but rather a portrayal of obsession and smouldering ego. Mimicking the creative process with the tensions of sexual psychodrama, Day-Lewis is simply riveting. If it's how he goes out, well, he went out on top. While he's not retiring from acting, Hugh Jackman is pointedly saying goodbye to his signature role of Wolverine, and lands in fourth place with his last portrayal of it in Logan. An aged, worn-down version of the character, world-weary from all his battles and losing everyone he cares about, Jackman takes the comic book material and creates a true character, paying off decades of film.